After an exciting weekend of AFC and NFC games, we’re getting one step closer to knowing which teams will compete in Super Bowl LI on February 5th. The Atlanta Falcons kept Seattle at bay with a solid performance by QB Matt Ryan who had 338 yards and 3 TD’s with no interceptions. Falcons move on with a 36-20 win. Everyone assumed the New England Patriots would cruise to victory over the Houston Texans, but three Patriot turnovers had many wondering if this game would end their season. The Texans defense clearly did their job to force 3 Tom Brady interceptions, but the offense couldn’t convert and the Pats pulled it together to win 34-16. 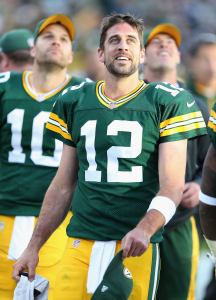 Green Bay Packers QB Aaron Rodgers was the talk of the weekend. In an excitingly close game against the Dallas Cowboys, where the Cowboys rallied back from an 18 point deficit to tie the game, Rodgers showed his brilliance. With just 35 seconds to go, Rodgers drew up the last play in the dirt resulting in a perfectly timed sideline throw to tight end Jared Cook setting up a field goal by Mason Crosby to win the game. Packers 34, Cowboys 31. With solid games from the Pittsburgh Steelers’ Le’Veon Bell and Antonio Brown, the Steelers defeated the Kansas City Chiefs by converting 6 field goals for 18 points. Steelers 18, Chiefs 16. After the game, Steelers coach Mike Tomlin gathered his team in the locker room to deliver a profanity filled speech/pep talk telling the team to “keep a low profile” in their AFC matchup against the Patriots. Antonio Brown recorded the speech and posted it to facebook. What about keeping a low profile says post me to social media for everyone to see????? As predicted, Tomlin is not too happy.